At RAINN, we’re dedicated to supporting survivors of sexual violence every day of the year—but each April we do a little something different. April is Sexual Assault Awareness and Prevention Month (SAAPM) and this year our theme is Awareness to Action. 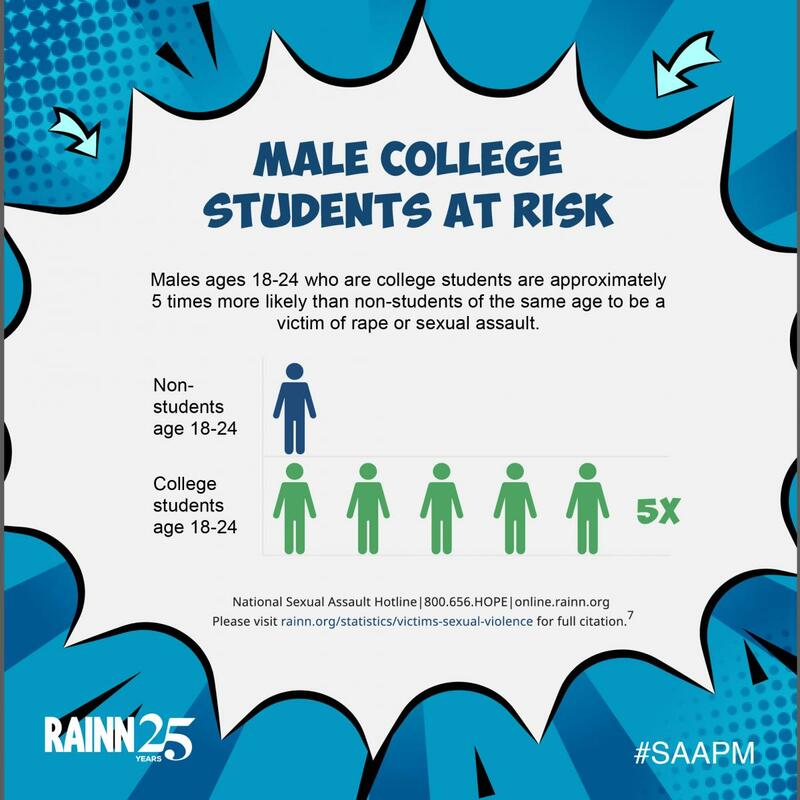 During #SAAPM we ask individuals and communities across the country to engage with this issue that affects nearly every household in America by learning more about sexual violence, sharing important statistics and information, hosting events, volunteering, and donating. Each week in April we’re featuring different ways you can get involved by promoting awareness and taking action. Want to get involved but need help getting started? We’ve got you covered. 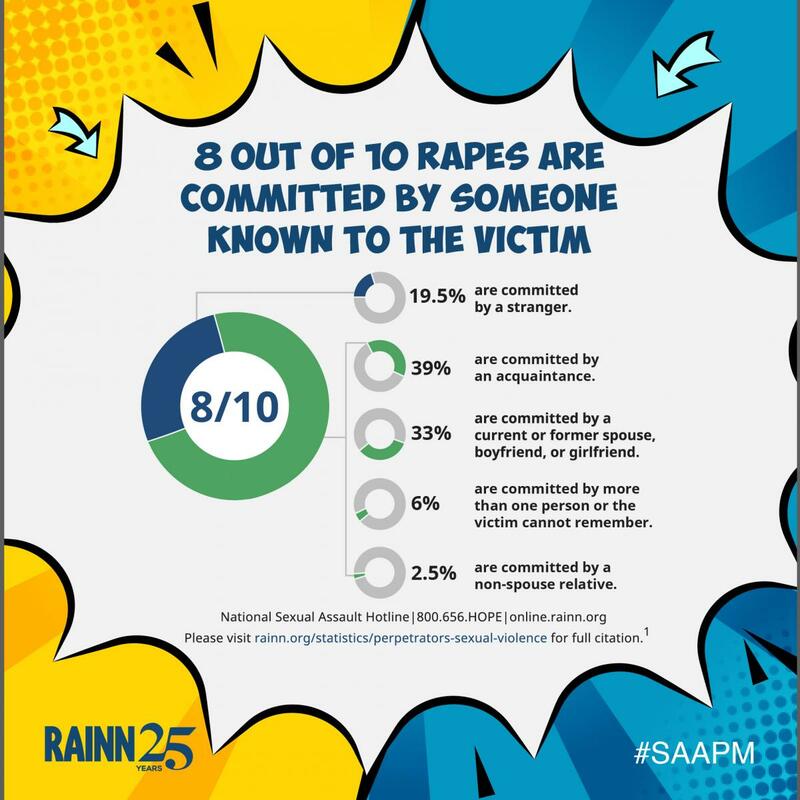 That’s why we created custom SAAPM graphics for you to share, tweet, and tag with @RAINN throughout the month, as well as many other resources below. 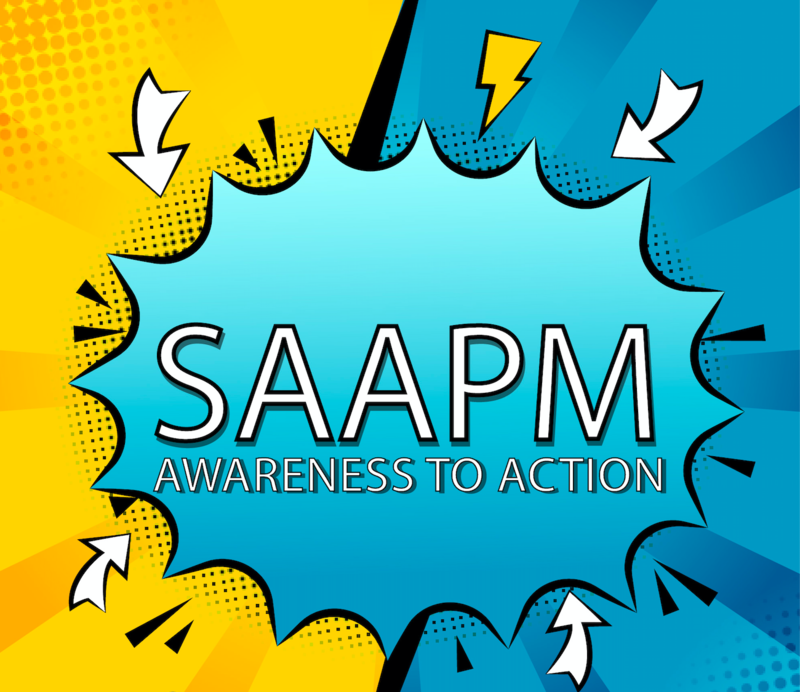 Scroll to explore or click to jump to each week of SAAPM to see how you can get involved. RAINN Day is an annual day of action this year held on Thursday, April 4, to help raise awareness about sexual violence on campus. You can participate by hosting a RAINN Day event in your community. 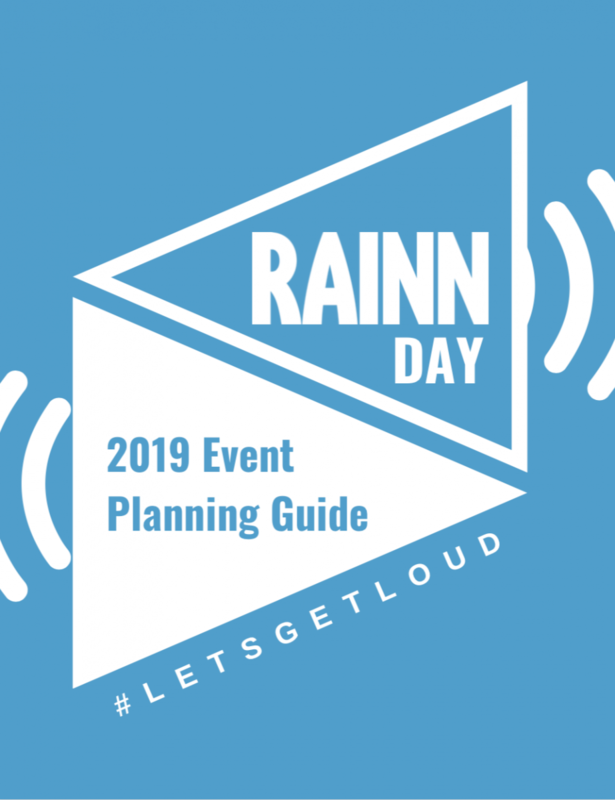 Download our 2019 Event Planning Guide to get started. Checking your social media feeds anyway today? 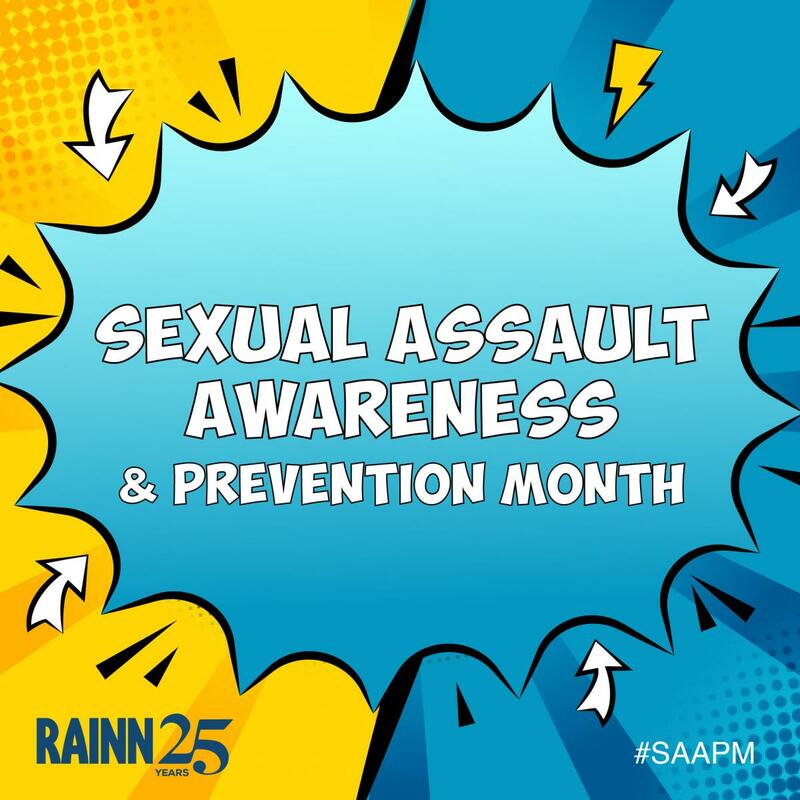 Follow RAINN on Twitter, Instagram, and Facebook where we’ll be sharing information, statistics, and graphics, and gifs for SAAPM throughout the month of April. Share our posts, tag @RAINN, and encourage others to do the same. During the first week of SAAPM, we’re hoping you can help us raise awareness of sexual violence in three simple ways. Post a photo on Instagram, Twitter, or Facebook of a blue triangle on your hand on Thursday, April 4 to show your support of RAINN Day. A blue triangle represents a megaphone to remind us to use our voices to spread awareness about sexual violence. 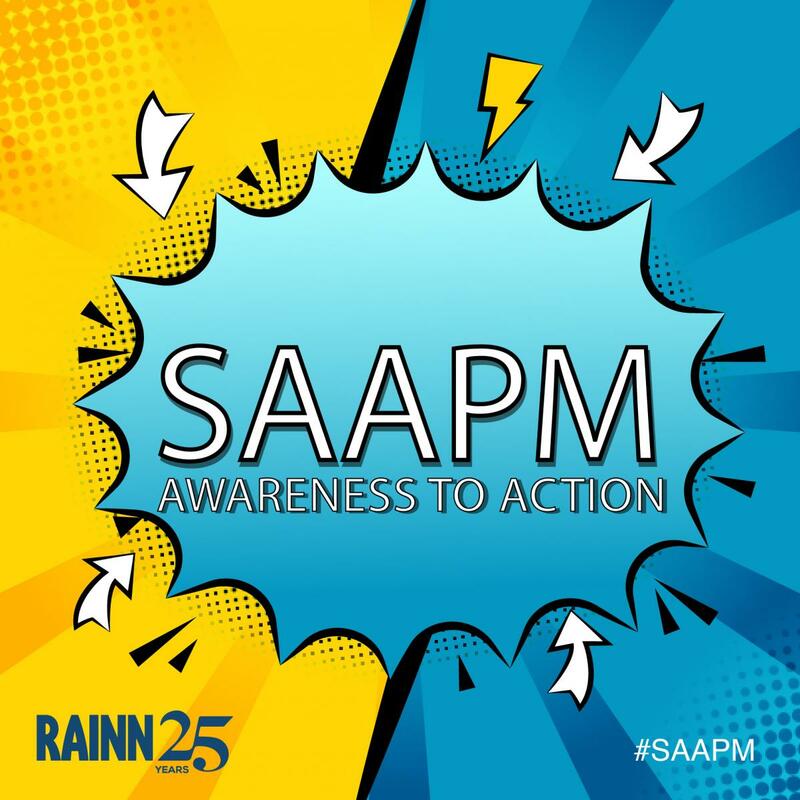 Change your Facebook profile photo to include RAINN SAAPM frame. Available on Facebook on April 1. Search RAINN SAAPM 2019 to find it. 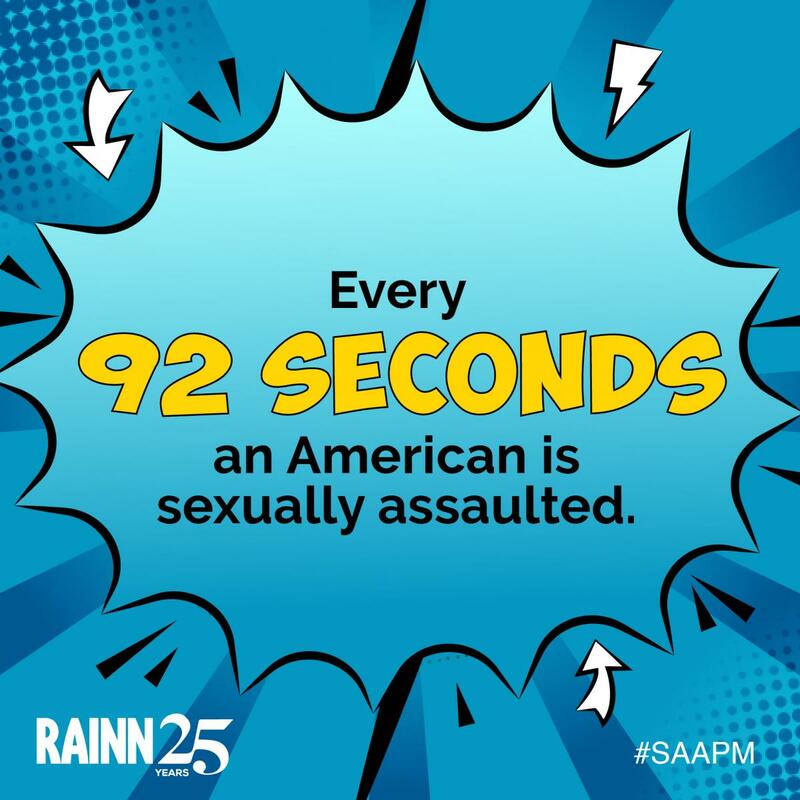 Tell one person in your life about RAINN and SAAPM. The second week of SAAPM is focused on sharing information about how you can support survivors and practice self care. Here are a few ways you can make it happen. Choose a self-care activity to participate in at some point this week. Think about going for a long walk, spending time in nature, spending time with supportive friends, journaling, or do something else that makes you feel strong, healthy, and cared for. For a little inspiration, take a look at RAINN’s self-care ideas. Order free print materials from RAINN’s online store, or print flyers/postcards from RAINN’s website, and post them in a coffee shop or other frequently visited area in your community. Share the National Sexual Assault Hotline number on social media: 800.656.HOPE (4673) or chat online at online.rainn.org. This week is about staying educated. Below are a few quick and simple ways you can share information about sexual violence prevention with your community. 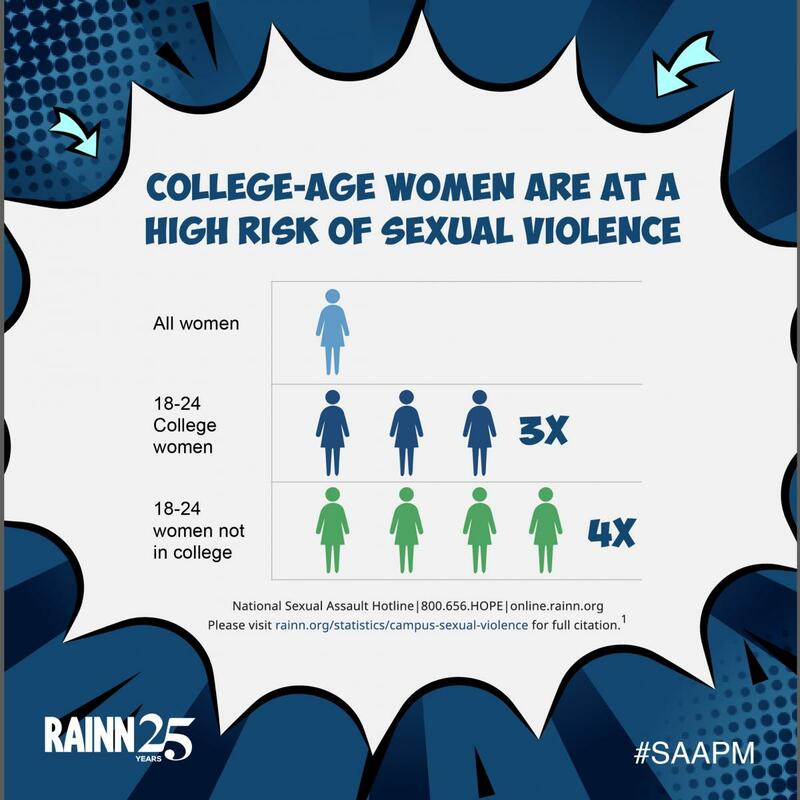 Share RAINN’s SAAPM graphics (above!). Read one new article on RAINN’s website. Then share it. Learn the laws in your state with our State Law Tool and share one that you didn’t know about before on your social media accounts. 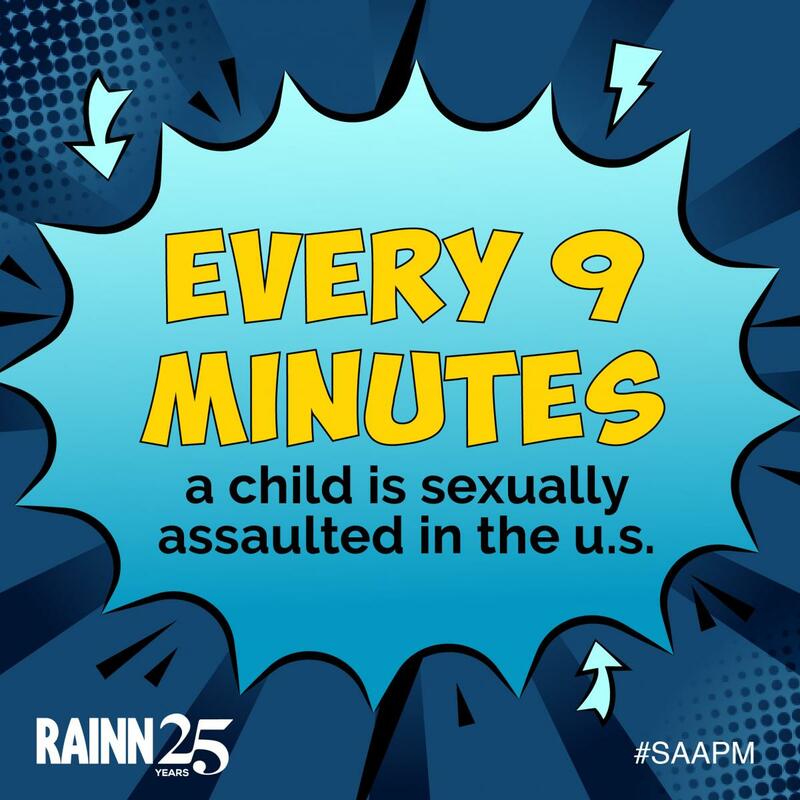 Tag us @RAINN with #SAAPM. Writing or speaking about sexual violence? Be sure to include these critical resources for survivors and their loved ones. Week four is about turning the awareness you have cultivated earlier in the month into action. There are many ways you can take action to support survivors in your community. Check out a few of our suggestions below. Write a post on social media about why you support RAINN and tag us @RAINN. Sign up to volunteer on the National Sexual Assault Hotline. Donate or encourage others to by starting a fundraiser of your own for RAINN. $42 helps one survivor on the hotline. This #SAAPM, your gift is matched. Join me in making sure every survivor has support: donate.rainn.org. As SAAPM wraps up, we remember that the work to end sexual violence continues throughout the year. Going forward, you can continue the work you have started this April in a variety of ways.